I was very taken with Ox Coffee on my first trip to Philadelphia in 2014. Back then it hadn’t long since celebrated its first birthday, but I was struck by its clean, simple looks and its dedication to serving excellent coffee with no frills: Stumptown’s ubiquitous Hair Bender blend on espresso, with two single-origins on bulk-brew filter. The major drawback was Ox’s size: if you wanted to sit in, there was the bench on the street outside, a simple L-shaped bench in the window inside and a narrow bar against the wall opposite the counter, with three bar-stools. I was, however, given a sneak preview of the back room, which was large enough for another L-shaped bench and a table, but which had yet to open. I was also told of plans to open the garden at the back of the shop, which was enough to entice me back on my first day in Philadelphia on my return in 2016 to see if the plans had come to fruition. The back room at Ox Coffee opened not long after my visit in March, 2014. In fact, I’m publishing this update on the second anniversary of my visit! The good news is that it lives up to the promise I saw during my sneak preview in 2014. Back then I wrote that I thought it was going to be a cosy hideaway in the winter and a bright, airy space in the summer. Well, having not yet made it to Philadelphia in the summer, I can’t comment on my second piece of speculation, but I can confirm that it makes an excellent, cosy hideaway in the winter! The back room is essentially square, with a bench against the right-hand wall, accompanied by a coffee table. The only other seating is a table extending from the left-hand wall, a pair of bar-stools on each side. It has a wooden floor and the whitewashed walls are hung with artwork, which changes every couple of months. There’s plenty of natural light from two windows, one on the left, the other on the back wall, plus there’s borrowed light from the corridor leading in from the front. A small and very lovely chandelier hangs from the ceiling, providing ample light in the evenings. The back room is a welcome addition to Ox, providing much needed extra seating. However, in many ways I’d prefer to sit out front, where there’s more of a buzz and you can chat with the baristas and get a feel for the ebb and flow of the coffee shop. However, the back room’s very cosy, which allows you to get on with your own thing (such as making notes for the Coffee Spot), something you can’t really do out front, with its lack of tables and constant distractions from the staff and other customers. When the weather’s warmer (it was -7⁰C while I was there!) the garden also makes an excellent alternative. Tucked away behind the shop and accessible through the back room, it’s about same size. A sheltered affair, with a brick wall on one side and a wooden fence on the other two, there’s enough space for four two-person tables. I imagine that in the summer it’s a lovely, sunny spot. While I was there, I caught up with Max, who I met on my original visit, as well as meeting Will, Max’s business partner, and Nicole, the head barista. 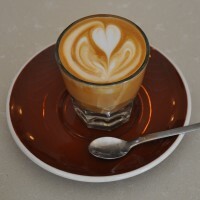 Naturally, coffee was consumed, in my case, a lovely decaf Gibraltar (cortado to you and me), made with some beautifully-steamed milk. I decided on decaf partly to preserve myself for the coming afternoon and partly because I had already had quite a bit of Stumptown’s Hair Bender blend in the previous days (including a cortado at Northerly Coffee and an espresso at Stumptown itself). The decaf went very well with milk, with the coffee coming strongly through. And with that, I was on my way. Hopefully I’ll be back one day to sample the garden in the summer! Don’t forget the original Ox Coffee Spot, which includes the complete write-up and an updated gallery. You can also see what I made of Ox Coffee on my return in 2018. This entry was posted in Cake, Coffee Gardens, Coffee Shops, Coffee Spot Updates, Philadelphia by Brian Williams. Bookmark the permalink.